Watching the story echo across the news last week, I was struck by the profound simplicity of this image, obtained through such complex means. Puzzled out through algorithms and vectors, the photo is not an artist’s rendering or a model — our previous stabs at picturing a black hole — but it is still a construction. The radio waves collected by the telescopes and assembled into the picture are translated into colour for our benefit. You can’t pick up a telescope, even one the size of the Earth, and see it for yourself. And yet, over the course of the day, I heard one line repeated again and again: We are seeing a black hole. Not “detecting” it by its radio signature, not digging up more evidence of its existence — actually seeing it. We didn’t lack proof that black holes existed. Ever since Albert Einstein reluctantly predicted them with his theory of relativity in 1916, we’ve been gathering evidence. In 1935, physicist Subrahmanyan Chandrasekhar hypothesised that a star might become so massive it would collapse under its own gravity. Then in 1969, Donald Lynden-Bell suggested that supermassive black holes at the centre of galaxies could be responsible for the huge energy signatures detected there, far beyond what stars alone could generate. In 2015, near-definitive proof arrived with the cosmic “zing!” that was the sound of two black holes colliding, a billion light-years away. For most scientists, the detection of gravity waves cinched it: Black holes were out there, churning up spacetime, even if we never saw them. I grew up under these cosmic visions. I remember napping beneath posters of the Pillars of Creation and the Cats Eye Galaxy at the Space Telescope Science Institute in Baltimore, while my mum sorted through data and proofread grant proposals at her desk. When I was a little older, I would entertain myself by launching a toy propeller in the hallway, to watch it drift along the currents shifting above my head. My mum told me that looking into space with a telescope was like looking back in time. Nothing ever disappeared from the universe, she said, it just got farther away. I understood this to mean that everything could be known, if we could just see far enough. At the Space Telescope Science Institute, my mum studied black holes, too, the ones that scientists were beginning to understand sat at the centre of most galaxies, spinning their skirts of stars around them like dervishes. We couldn’t see them, but we could see the radiant clouds of light and energy surrounding them. 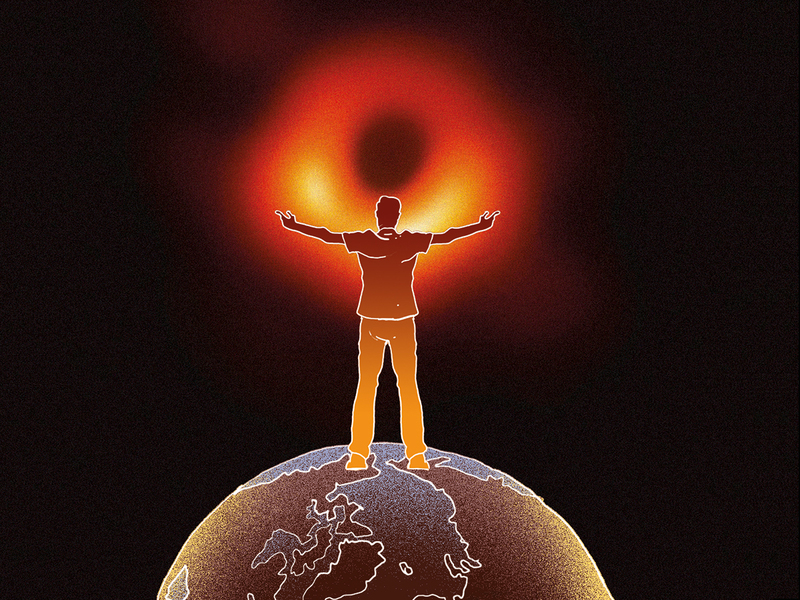 The paradox of the black hole is that, while no light can escape its limits, the regions just beyond the event horizon are some of the most energetic and bright places in the universe. From her, I saw how you could follow the trail of the visible, hunting for signs of the invisible. Behind the image of the halo at the centre of Messier 87, one of two galaxies in the EHT’s crosshairs, is a reminder of the challenges we face when looking for these unseeable objects. The second target of the EHT, Sagittarius A*, is the black hole at the centre of our own galaxy. Though much closer to us than M87, it is also smaller and therefore more prone to shifting out of focus, like a fidgety student on picture day.